Art, history, culture, diversity and of course food and beer capture the essence of Philly on this epic journey through our city’s great neighborhoods! From Jewish delis to Italian markets, churches, cemeteries, public art, and local craft beer, this tour gives you a slice of the real Philly. See the iconic landmarks that shaped America before tapping into Philly's legendary beer scene on this total Philly adventure. Discover the diversity of Philly in the best way possible — local style! 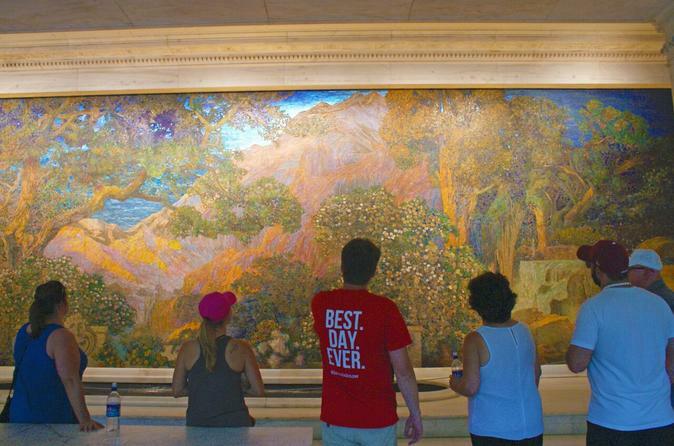 You’ll start your tour exploring the ever-colorful South Street, then into the Bella Vista neighborhood for a glimpse of some beautiful mosaics. From there, we’ll hit up the oh-so-tempting tastes of the famous Italian market- the oldest and largest everyday open-air market in America.It is one of Philly’s must-see attractions as you wander past the myriad of local stores carrying everything from cheese to chocolate, as well as the city’s best bakeries. We'll continue this tour with Philadelphia’s Magic Gardens, which showcases the mosaic art of Isaiah Zagar. On the next part or your journey, you’ll visit those unmissable Philly sights. You’ll gather at the Philly Tour Hub, where you'll meet your second guide of the day (or possibly continue on with your first guide). From there, we’ll weave through the charming back alleys of Old City, and down the oldest continuously occupied residential street in the country. You'll get some great views of the site of Ben Franklin's home as the tour continues through Philly’s Historic District. Past Franklin Court, you’ll be greeted with views of Independence Mall, the National Constitution Center, and the U.S. Mint. We’ll also pass the Liberty Bell, where we might get a chance to go inside for pictures. Then off to Washington Square for stories of William Penn and possibly visit the Tomb of the Unknown Soldier. We continue through Independence National Park and the must-see front yard of Independence Hall, sight of the signing of the Declaration of Independence and the US Constitution. In our opinion, there are few better ways to get to know a city than over a beer with a local. You'll meet your beer guide (or potentially continue on with one of your original guides!) at City Hall just as locals are finishing up their workday. We’ll have the option to visit the oldest continuously operating bar in Philadelphia, a classic dive bar, an Irish pub with local flair, a modern beer café, and many other neighborhood bars and pubs. At each location, we'll talk about the history of these bars and why they are so popular. One drink at each bar is included with the tour, as well as a pub or street snack. And the bars we visit all have one thing in common: a taste for Philadelphia's local craft beers and breweries! After happy hour, end your Philadelphia tour at the tour's final pub. From there you’ll be able to continue on your own Philly beer journey, grab some dinner at one of Philadelphia's many great restaurants nearby, or head straight back to your new favorite Philadelphia pub.